At Insignia on M, we strive to offer the best residential living experience by going above and beyond. And that doesn’t stop at our extensive amenity package, high-end features, or unrivaled services; it also influenced the way our spaces were conceptualized and designed. So what makes our interiors so unique? 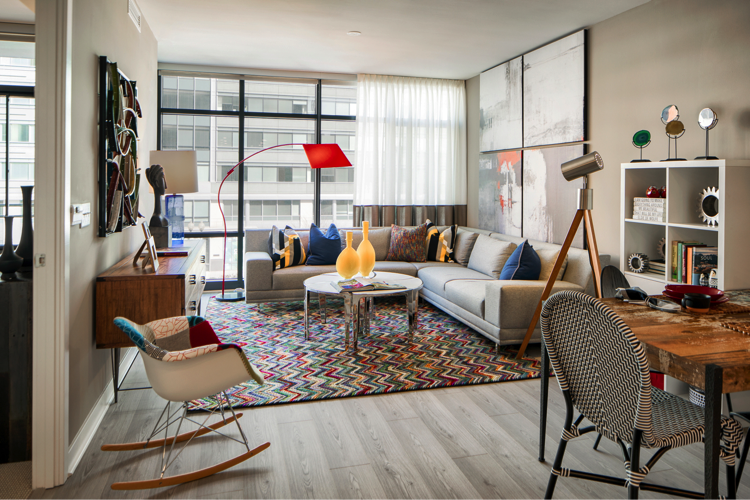 For one, a maximalist approach: Our residents are one-of-a-kind, and we wanted our interiors to match. That’s why when Hartman Design Group designed our common spaces they chose bright colors, bold patterns, and attention-grabbing light fixtures and furniture to anchor the building’s light-filled rooms. Insignia on M is also all about access: Access to the bustling Navy Yard community, to lush parks and delicious restaurants, to nightlife, to transportation, and to an easy yet active lifestyle. As the fastest growing neighborhood in DC, Navy Yard doesn’t stop, and Insignia’s interiors were designed to mirror the hustle of the neighborhood. That’s why we incorporated details like our keyless fob entry into our design – gone are the days of shuffling around to open doors while holding groceries in one hand and dry cleaning and a pet’s leash in the other – say hello to seamless transitions from errand running to relaxing at home. 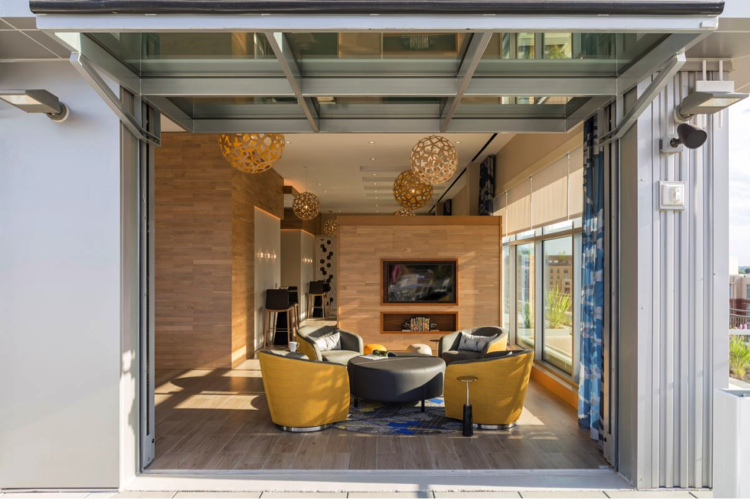 Our floor-to-ceiling windows, breezy balconies, and rooftop garage-style doors also help bring the outside in, providing residents endless access to the outdoors. Insignia on M’s design is also heavily influenced by the idea of making common spaces socially active. 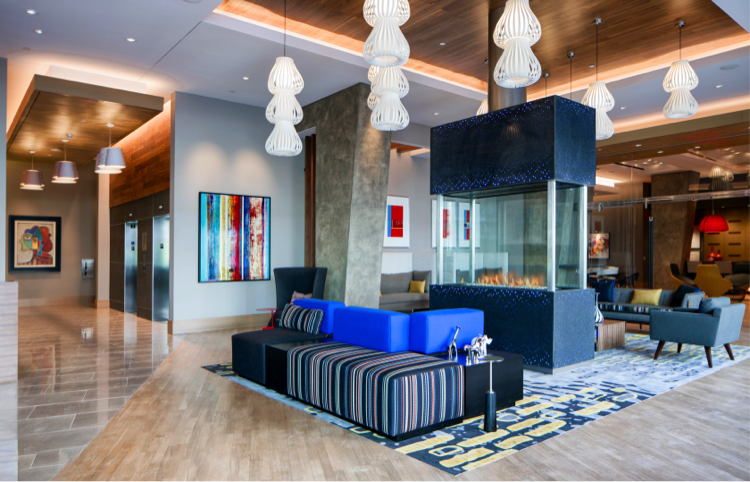 The lobby offers the perfect setting for residents to gather with its linear fireplace, canopied by color changing LED lights. Prefer a room with a view? The rooftop was designed with three indoor communal stations and a full outdoor patio for residents to mingle, host a get together, or watch the game. Insignia on M was designed to be more than a very good Navy Yard apartment; it was carefully crafted to be the best apartment in Southeast DC. Whether it’s the building’s bold and eclectic patterns and colors, its attentiveness to convenience and access, or focus on facilitating social interactions, every detail was finely rendered to elevate residents’ daily lives. Come check us out the next time you visit Southeast DC.